Mediterranean diet has been demonstrated to reduce cardiovascular risks, certain subtypes of cancer, chronic disease, and cognitive health. Recently, a bibliographic review developed by a group of several Spanish centers has compiled the existing information on the association between osteoarthritis and the Mediterranean diet. Although there is no universal definition to define this diet, they all include high consumption of fruit, vegetables, legumes, nuts, seeds and cereal; greater intakes of fish and seafood; moderate consumption of poultry and eggs; as well as frequent, but moderate, intake of red wine and olive oil as the main source of dietary lipids. The studies analyzed underlined a relation between osteoarthritis and a Mediterranean diet. These researches described a positive association between a higher adherence to a Mediterranean diet and the quality of life of participants suffering osteoarthritis. Studies carried out by the University of Kent (U.K.) and the University of Padova (Italy) show that patients adhering to Mediterranean diet present fewer depressive symptoms and significantly lower level of pain and disability and better mobility. Also, the prevalence (the proportion of a particular population found to be affected by a medical condition) of osteoarthritis was lower in the group of participants to the studies who reported a higher adherence to Mediterranean diet. 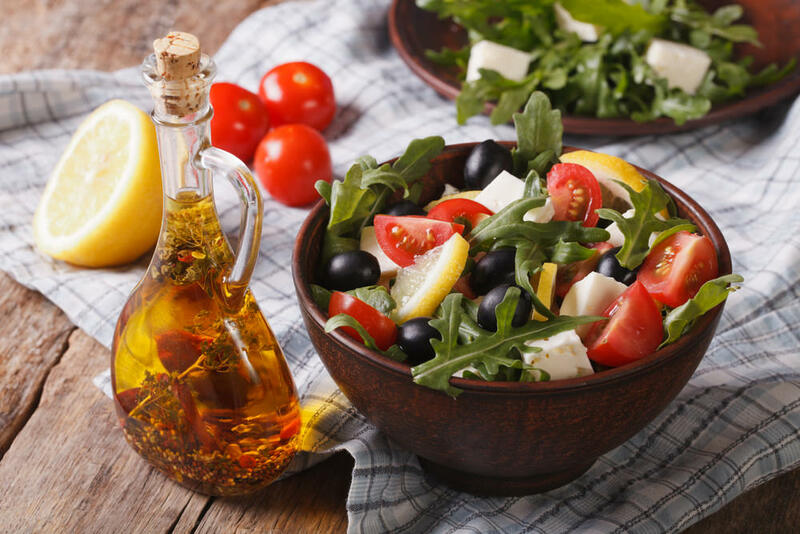 Mediterranean diet besides helping patients reducing overweight- one of the most common risk factors for osteoarthritis – have been described to have a protector effect due to its anti-inflammatory and antioxidant capacity. Obesity induces a low-grade systemic inflammation caused by the secretion of inflammatory proteins for osteoarthritis. Thus, not just excessive body weight leads to wear and tear of the joint, as suggested by the association between overweight and hand osteoarthritis. Indeed, another Italian study showed that patients following a Mediterranean diet presented lower levels of biomarkers of inflammation and cartilage degradation, indicating that this diet has a positive effect not only in maintaining a healthy weight but also in fighting inflammatory states. Several studies have described an increased risk of osteoarthritis in association with metabolic risk factors typical of the metabolic syndrome, such as dyslipidemia, hypertension, and insulin resistance. About 60% of patients with osteoarthritis have metabolic syndrome, more than double compared to 23% of the general population. Patients with osteoarthritis and metabolic syndrome suffer from higher degrees of inflammation and pain compared to arthritic patients without metabolic syndrome. The Mediterranean diet thanks to its anti-inflammatory propriety has been shown capable of reversing the metabolic syndrome, and also improving the quality of life of patients. Current knowledge suggests that this type of diet could reduce the prevalence of osteoarthritis, however, research in this field is recent and a longer intervention is needed to evaluate the long-term effectiveness of the Mediterranean diet in improving the symptomatology and the prevention of osteoarthritis. All of OAFI’s prevention education programs ( OAFI WOMAN, OAFI SPORT, OAFI SPORT VETERANS, , etc.) include training in healthy eating as an important part of the program. Discover them!